The happiness that comes from giving was not experienced by quite as many people in 2009, the year of the crisis, as in previous years. With approximately 12.7 million donors over the age of 10, the total in Germany dropped below 20% for the first time. These are the latest findings from the “Balance sheet on giving” survey, which has been regularly conducted by GfK Panel Services Germany on behalf of Deutscher Spendenrat e.V. since 2004. Over the first half of the year in particular, which is traditionally a period of lower donations, Germans were less willing to donate, and the spending volume was more than 6% below that in the first half of 2008. However, this negative result was almost offset in the second half of the year. As the images of natural disaster victims in South East Asia circulated around the world, Germans were quick to react and the willingness to donate increased dramatically. 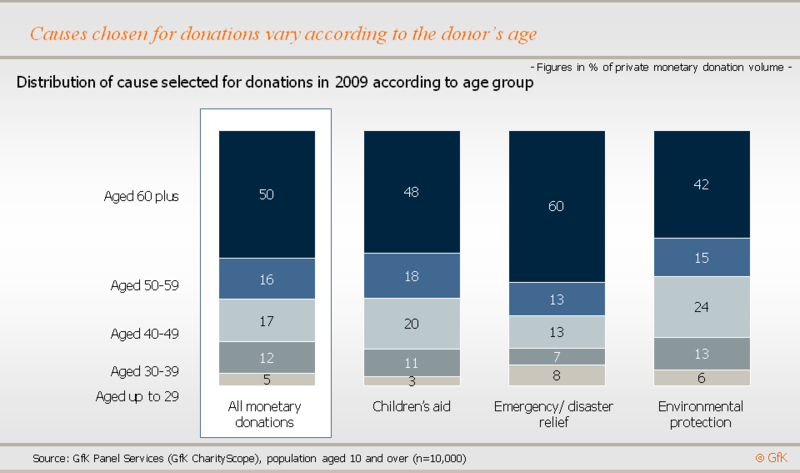 Last year, the 60 plus generation were again responsible for the lion's share of donations. Although this age group only includes a little more than a quarter of Germans aged ten and over, they are responsible for half of the total donation volume. 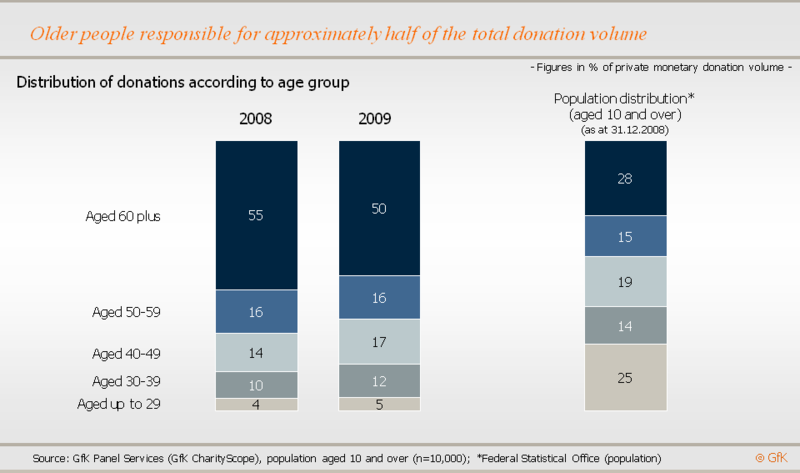 In comparison, a quarter of the population are aged 10 to 29 but they only generate 5% of the donation volume. While the increasing age of society may be a burden for social welfare funds, older consumers are an invaluable group for the donations market. Without their contributions, Germany’s donation accounts would be looking rather grim. Germany has been relatively consistent in its choice of charitable causes for many years: humanitarian aid has been top of the list by far. Germans will dig deep in their pockets to support victims of natural disasters, people in need, with disabilities or illnesses or to develop educational institutions, with more than three quarters of donations going to these causes. In 2009, one in every four euros donated went to churches and other religious organizations. However, in light of the current debates, it is possible that future surveys will show a change in this trend. Children’s aid is the second greatest recipient of humanitarian donations, with the number of sponsors continuously increasing since 2007. Last year, 20% of the total donation volume was received by these charities. Donors aged 40 to 49 are particularly concerned for the weakest members of society. While their overall contribution to total donations is 17%, they generate 20% of the aid budget for children. 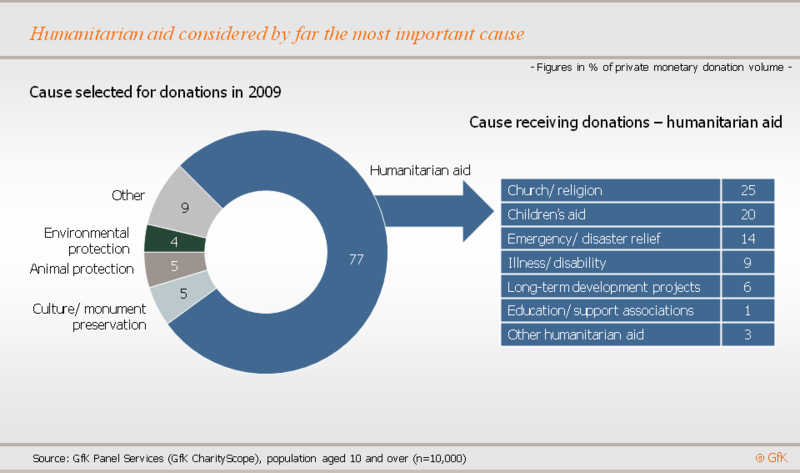 Following the church and children, emergency and disaster relief was the next most common cause chosen, receiving almost 15% of donations for humanitarian aid. Germans aged 60 and over were particularly willing to donate to victims of disasters, contributing nearly two thirds of the funds for emergency and disaster relief. But the under-30s also gave more to this cause, with their donations constituting approximately 8% – almost double their percentage share in overall donations. As a consequence of this high level of support for people in need, less funds are available for cultural development, animal welfare and environmental protection. Germans donated 5% for culture and monument preservation and the same again for animal welfare. Support for environmental protection was just a little lower than this, with organizations for the protection of endangered species, forests and oceans receiving 4% of all donations last year. Here, too, it is evident that age influences the choice of charitable cause. Almost 45% of donations for environmental protection are attributable to those aged under 50, which is approximately 10% higher than their percentage share for all monetary donations. Natural disasters, war, malnourished children – aid is necessary in many different areas and as a result, the market for donations is competitive. Direct approaches in seeking donations have continued to be fruitful. In 2009, those organizations which appealed for donations through direct postal appeals were most successful, generating almost 30% of donations. In the group aged 60 and over, as much as 37% of donations were gained by this method. Appeals from the church both during and outside of services generated just over 10% of donated volume. Membership of a charitable organization or a recommendation from a friend motivated 8% and 6% of donations respectively. It is actually not necessary for charitable causes to spend on additional advertisements, as one in five of all donations were not as a result of requests, but purely out of habit. In fact, regularity is the most important motivations behind donations for those aged under 50. Click here to access the website of the Deutschen Spendenrat e.V.